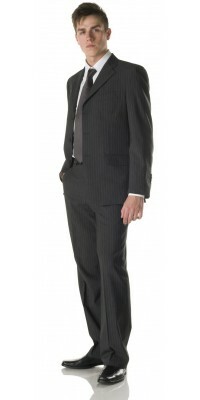 Wool Blend Grey Pinstripe There are 5 products. Corbara Professional Wear: work in style! Discover hotel garments in Grey Pinstripe. 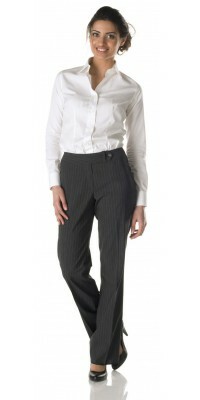 For that in search of style and elegance in their work clothes, Corbara proposes uniforms in Grey Pinstripe fabric (see also Blue Pinstripe); Professional Front Office wear suitable also for other back office tasks. These uniforms are produced in stretch lightweight wool blend, a fabric that is suitable for all Seasons, that ensures great comfort together with a good fit and excellent crease resistance. The composition of this fabric is 60% wool 38% polyester and 2% elastic fiber, with a prevalence of natural fibers to ensure maximum comfort; the use of polyester in the fabric makes the garment more durable and resistant to wear. This hotel uniform series includes men suits with Perugia Jacket and Saturno trousers, and female outfits with Mantova Jacket, Roberta pants and Ametista Skirt.